Korte Vuldersstraat 14, 8000 Bruges, Belgium. Huis 't Schaep is a small luxury Private Guesthouse - a combination of a small boutique hotel and the personal touch of a Guesthouse. We are located in one 16th century and one 17th century building, which were joined together around 1850 in neogothical style. You will find us in the historic city centre of Bruges, very close to the cathedral and with all the major tourist attractions, shops and restaurants on our doorstep. Bruges' big city parking, Parking 't Zand, is a two minute stroll away. 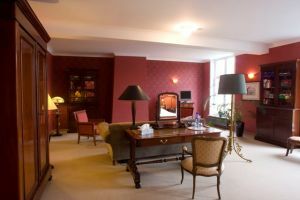 With our luxury Suites decorated with stylish (antique furniture, we aim to please our Guests. Centre, Museum Area, Near the historic centre. Breakfast always is made with fresh ingredients. Fresh fruit and rolls are a part of our well-known breakfast. A full English Breakfast is also available at an additional cost. Please inquire for your breakfast options when booking. 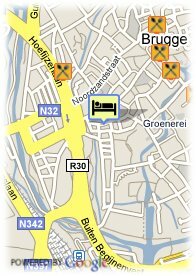 You will find us in the historic city centre of Bruges, very close to the cathedral and with all the major tourist attractions, shops and restaurants on our doorstep. Bruges' big city parking, Parking 't Zand, is a two minute stroll away. The main shopping street in Bruges is just around the corner. Also the marketsquare with the Belfort-tower is only a 5 minutes stroll away. Still Huis 't Schaep is situated in a very quiet street.